This article explains and gives a practical example of how support of сomponent navigation properties is implemented in Entity Developer for NHibernate. 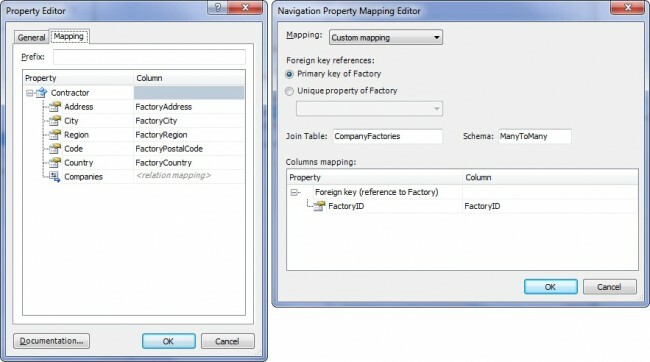 Support of this functionality includes the possibility of detaching to a complex type for further reusability not only scalar entity properties but also navigation properties with subsequent customization of complete mapping at the level of private mapping of a certain property with type equal to complex type of a certain entity. 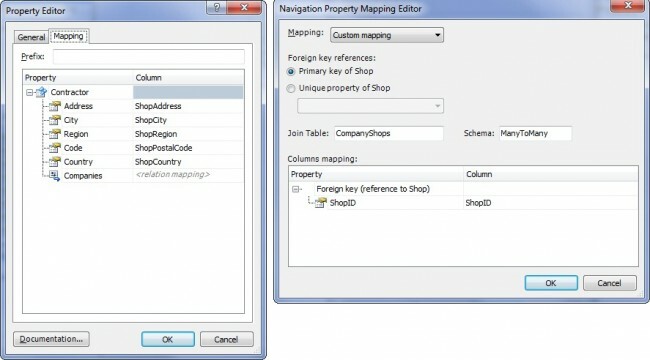 In this article we will consider many-to-many mapping of сomponent navigation properties. To find out more about the rest of the types of сomponent navigation properties mapping, see the article devoted to them here. This type of mapping can be efficient in case there are several entities in the model connected with many-to-many associations with the same entity, and also possibly (but not obligatorily) having some set of properties similar in meaning and structure. 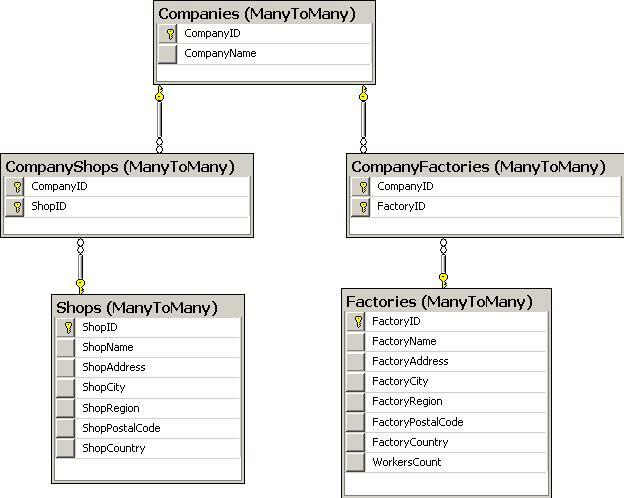 Then, after creating a model, it makes sense to detach the similar set of the corresponding scalar and navigation properties into a separate complex type, and replace every such set in entities with a single property having type equal to complex type and an appropriate customization of private mapping for this property. The database contains the Companies, Factories and CompanyFactories tables, the last one provides references for a many-to-many relation between the Companies and Factories tables. 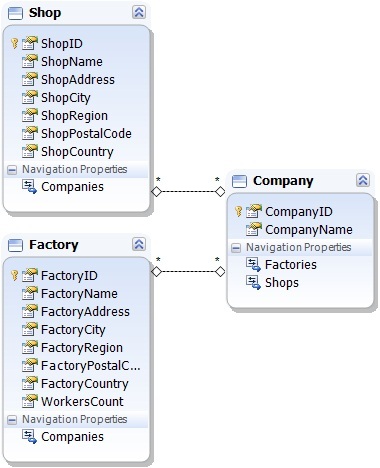 The database also contains the Shops and CompanyShops tables, the latter also provides references for a many-to-many relation between the Companies and Shops tables. add the Companies, Factories, Shops, CompanyFactories and CompanyShops tables to the model. We select the ShopAddress, ShopCity, ShopRegion, ShopPostalCode, ShopCountry properties and the Companies navigation property of the Shop entity, drag and drop them into a separate complex type and call it ‘ContractorType’; an association appears between this complex type and the Company class and from now on it is the СontractorType complex type that contains the Companies navigation property, and instead of the set of the moved properties the Shop entity contains a property with the type equal to ContractorType, let’s call it Contractor. 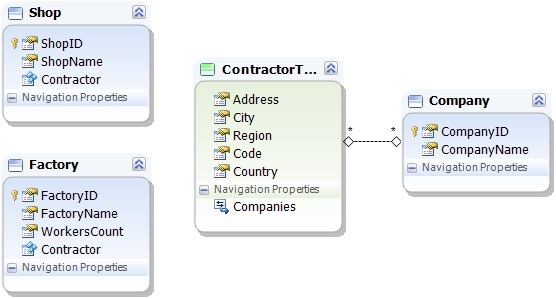 This is not mandatory, but for the sake of convenience we remove the Shop prefix from the names of the properties and columns of the ContractorType complex type in the default mapping. 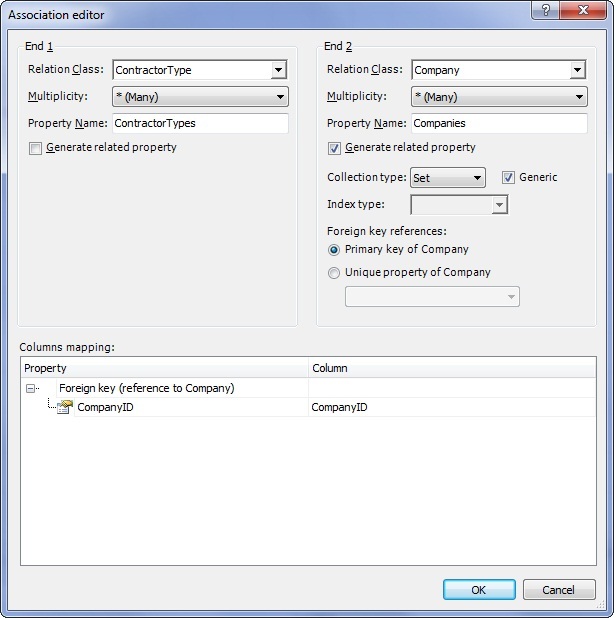 As can be seen from the Association editor dialog box, part of relation settings is in the association itself, for the many-to-many case there is also a default mapping for the foreign key column of the join table for an entity which will contain the property of the specified complex type, but if necessary, it can be changed to a custom one for a certain entity property. This will be shown in our example further in this article. /// There are no comments for ContractorType in the schema. /// There are no comments for Address in the schema. /// There are no comments for City in the schema. /// There are no comments for Region in the schema. /// There are no comments for Code in the schema. /// There are no comments for Country in the schema. /// There are no comments for Companies in the schema. /// There are no comments for Company in the schema. /// There are no comments for CompanyID in the schema. /// There are no comments for CompanyName in the schema. /// There are no comments for Shop in the schema. /// There are no comments for ShopID in the schema. /// There are no comments for ShopName in the schema. /// There are no comments for Contractor in the schema. /// There are no comments for Factory in the schema. /// There are no comments for FactoryID in the schema. /// There are no comments for FactoryName in the schema. /// There are no comments for WorkersCount in the schema. As can be seen from the generated code, a property is generated in the ContractorType class, containing a reference to the Company class, and the classes Shop and Factory in their turn both contain a Contractor property with type equal to ContractorType, and these properties describe addresses and the list of products of the manufacturer and distributor respectively.